She knew her father was different to other fathers. He was far more clever, and some say he had magic in his soul. And she was not like other little girls, she knew that too. How could she be, with a father like him? He taught her many things – poetry, philosophy, the mysteries of the universe. He told her, over and over, the only thing that mattered was choice. “What do you mean father?” she would ask. For many years this was but a wordplay between them. Se knew what he meant, on some level. When she had a crush on a boy at school she yearned to know how he felt, if such feelings could be rerutned. But she could not know. Not without an action. Not without blind choice. And again, when she attempted exams to further her studies, sometimes she knew the answers and sometimes it was just a guess. So choice, as ever, meant the difference between a high mark or low, a pass or fail. On her eighteenth birthday her father took her to a house. She had never been there before but it seems he owned it, but had not told her or her mother of the fact. This was not surprising, for he was full of secrets. But she did not know why he brought her there that day, or why he was so grave at a time that should be celebrated. 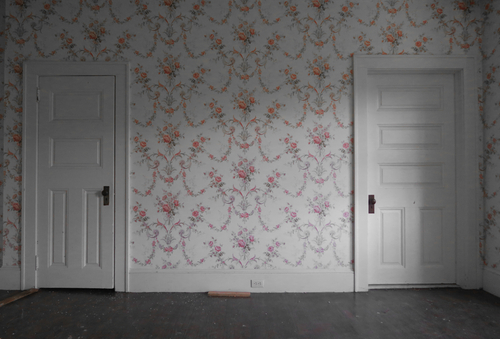 At the top of the stairs was a hallway with two doors, innocent and white, both closed. She regarded the doors for a moment, weighing the balances of both her fate and that of her beloved father. One door may open to a heaven, and the other to a hell. But which was which? There was simply no way to tell. She walked slowly, choosing the door to the right, and hesitated a moment before opening it. All she saw was the darkness, swirling around her. The unknown, the untested, the unborn. But her heart broke just a bit when she heard her father scream. And yet, because she had to, she walked through the door and into the darkened room. This entry was posted in Horror Flash Fiction and tagged choice, dark and light, fate, good and evil, hope, Horror, horror flash fiction, knowledge, love, oneness, singularity, unknown. Bookmark the permalink. Deep one. How is it any of us know if our choice is the right one?